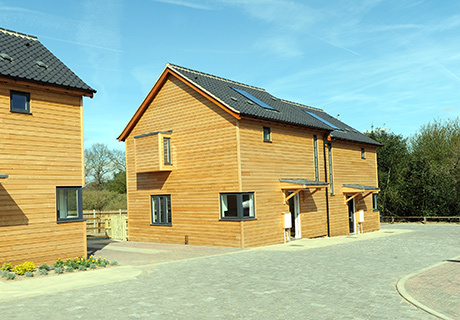 This scheme of eight GreenGauge Homes in the village of Horstead are fully occupied by local people in housing need, sourced by the Broadland District Council Housing Department. The exception site is part of a County Wildlife site and the architects liaised with Norfolk County Wildlife Services to ensure they were built on the least ecologically sensitive part of the site. To leave the smallest impact the houses are arranged in a tight courtyard, and privacy for individual inhabitants is enabled by concentrating the habitable rooms to the rear of the site, where views of the countryside are maximized. An improved interior layout with wider properties, larger gardens and measures to avoid overlooking has produced a group of houses which compare favourably with many affordable housing schemes of this kind. The structure for the Horstead scheme is an Engineered Timber Frame which achieves a U-value of 0.144 W/m²K. 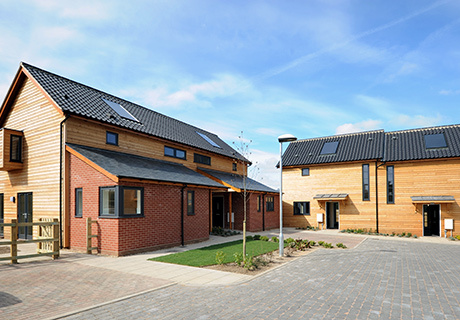 Homes have Air Source Heat Pumps and solar water preheating and the project has been assessed as a very good Level 4 of the Code for Sustainable homes. The form of construction used could be extended easily to enable a Level 5 rating if necessary on future schemes.